A trip is the perfect occasion for a cook to get ideas and inspiration for your own recipes. It is a big school. Travelling also implies to taste “in situ” whatever grabs your attention. An immediate learning that awakes all your senses. Today´s recipe was born in a trip to Berlin this last winter. Berlin is a city with an amazing cultural mix that is reflected in its endless dining options. On Sunday we were lucky to visit the Neue Heimat, a compulsory meeting point for street food which is organized in several abandoned hangars painted with graffiti, which have become a paradise for the lovers of the street food movement, like myself. There was such a variety that it was almost impossible to decide what I wanted to eat (especially when you are feeling very hungry): Russian raviolis with buckwheat, dim sums, brioche with butter and scrambled mushrooms, burgers of all kinds, food fusions from different countries, artisanal ice creams with amazing flavours, typical and non-so typical patisserie. Luckily it was cold and the return to the hotel was a long tiring walk, because otherwise it would have been impossible for us to digest properly the huge amount of dishes we ate. 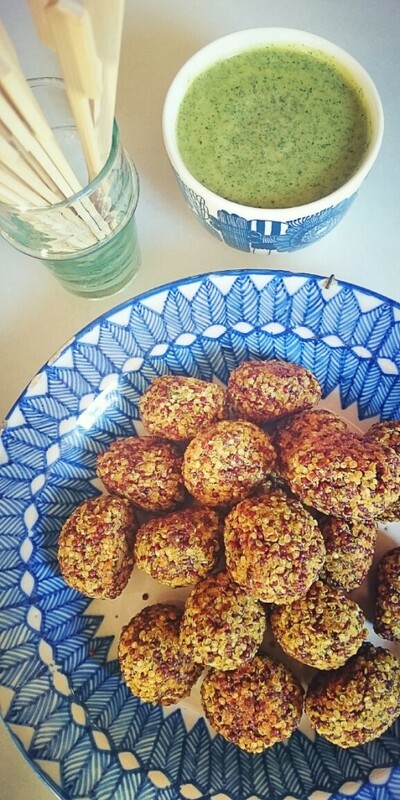 One of the things I really liked were some kind of quinoa falafel. I thought that I would have to do it when back home. But months went by and the opportunity only came up the last week. The reason: I was preparing a basket with food for a friend who had given birth. And that doesn´t eat eggs. Then the quinoa falafel came to my mind. The memories appear when you less expect them. I tried it for the first time and although this is not normal, I got it right the first time! You can get them done very fast, they are very nutritious and you can eat them both hot and cold. What is a very useful thing. Specially, if for example you want to take them to your workplace. You can get the dough ready the previous day. 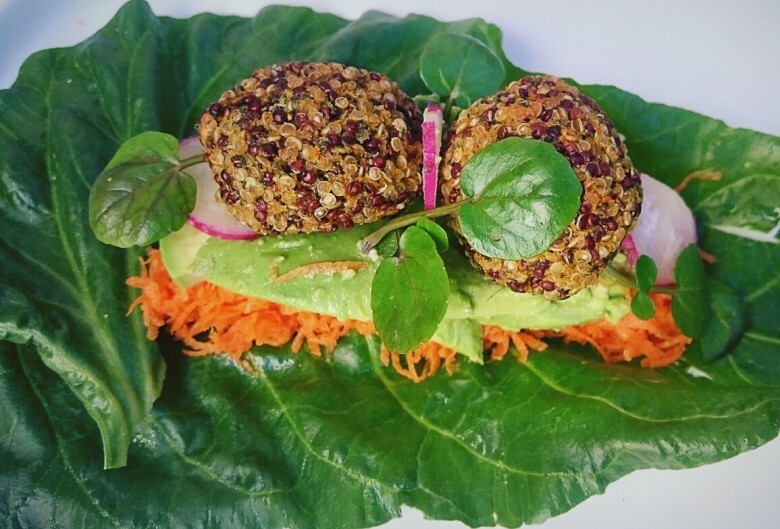 The falafel can be eaten inside a pita bread with vegetables, or you could do what I do which is rolling them in a Swiss chard or raw cabbage leaf with grated carrot, avocado, radishes and watercress, an amazing option which adds more raw vegetables to the food. You can use the sauce to accompany any other dish, if you grind all together for about 5 seconds, you will get a very refreshing flavour, full of chlorophyll that will help to clean your blood! But I also propose another thing, if you are thinking of a “finger food” meal you can place them in a plate with the sauce in a bowl and some chopsticks so that people can serve themselves. Just to give you some info: the quinoa is a very nice gluten free pseudo-cereal , which can be cooked very fast, is very easy to digest and provides a high intake of protein, minerals and calcium (more than the milk), besides giving us a lot of energy. It is a perfect alternative for a nursing mother! I use in this recipe two different types of quinoa but you can also use only one, whatever you prefer. It is important to wash it before cooking, in case there is some saponin left, a substance that covers the quinoa and helps to protect her from the insects but which gives a slightly sour flavour. It is a very versatile cereal that you can use in salads, soups, porridge, crush it and make flour for sweet preparations…Try to buy it in a fair and organic trade shop because the high demand nowadays causes the deforestation of some areas where the quinoa grows. Now you will only have to get out and buy the ingredients, get a lot of mint and plant it! Wash the quinoa, put in in a ladle with cold water and a pinch of salt and bring it to boil. Cook slightly covered at low heat for about 15 or 20 minutes, or until you see that the water evaporates. Let it cool down in a bowl. Crush the garlic, the onion, the parsley, the mint, the carrot, the salt and the cumin. Add 3 spoons of the cooked quinoa and crush again till you get a sort of paste. Pour it over the bowl with the rest of the quinoa. 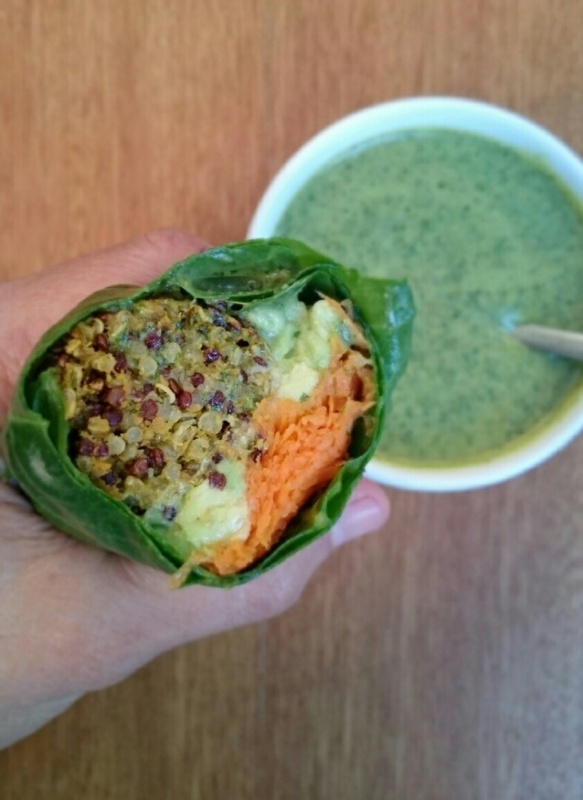 In a grinder, grind the flax together with the oats and add them to the quinoa bowl. Mix everything well with your hands and let it stand for about 30 minutes. Make the sauce grinding all together. Cool it down. Make small balls with slightly wet hands, put them in an oven tray, pour a drop of oil over them and shake the tray a little so they can get evenly covered with the oil. Roast at 200º for about 20 or 30 minutes, or till they start to get a nice golden color. Halfway the cooking, move the tray a little. Serve them as they are with the sauce and a salad, or make a small roll for yourself!